GLAS is proud to welcome Gare St. Lazare back to Geneva with a provocative new work TITLE AND DEED from the pen of the American playwright, Will Eno, who was recently shortlisted for a Pulitzer Prize. The production is stopping off in Geneva before it opens at the Edinburgh Fringe Festival having already enjoyed great critical acclaim in the US. 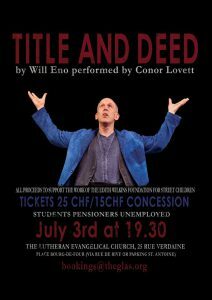 It was specially written for Conor Lovett who plays a man who has just arrived and wants to tell you about his homeland. Eno has crafted a powerful experience with a character whose word play and charm may answer almost as many questions as he asks. In a world where fewer and fewer people can claim to be ‘from here’ this play searches for the possibility of connection. GLAS has negotiated a football free evening with FIFA to avoid any clash with the World Cup and it all takes place in a beautiful venue in the heart of the old town. “DARING, SPECTACULAR AND HILARIOUS! STAGE POETRY OF A HIGH ORDER!